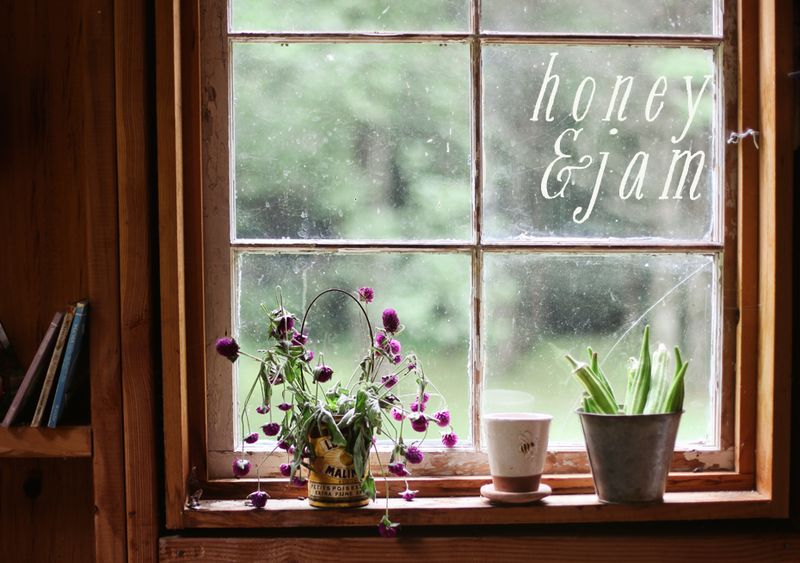 honey & jam | recipes + photos: Shortcake in the Afternoon. 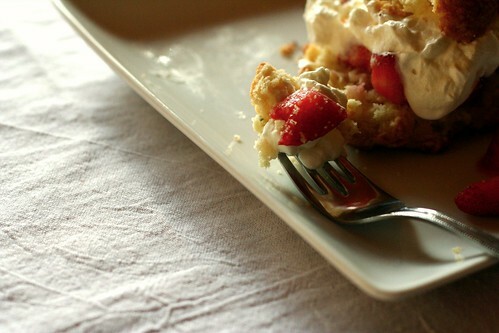 It's been a shortcake kind of day - even with all the snow. These were simple, not too sweet and delicious. Homemade whipped cream is the best. Whisk the flour, baking powder, salt and sugar together in a large bowl. Drop in the butter and, using our fingers, toss to coat the pieces of butter with flour. Quickly, working your fingers or a pastry blender, cut and rub the butter into the dry ingredients until the mixture is pebbly. Pour the cream over the dry ingredients and toss gently turn the ingredients with a fork until you’ve got a very soft dough. When the dough comes together, you’ll probably still have dry ingredients at the bottom of the bowl - just use a spatula or your hands to mix and knead the dough until it’s evenly blended. Don’t overdo it; it’s better to have a few dry spots than an over worked dough. Spoon out about 1/3 cup of dough (i just stuck mine down in a 1/3 measuring cup and then rolled it in a ball to get even cakes) onto a baking sheet, leaving about 3 inched of space between the mounds of dough. Pat each mound down until it is between 3/4 and 1 inch hight. Bake for 15 - 18 minutes, until the shortcakes are puffed and giver just a bit when prodded. 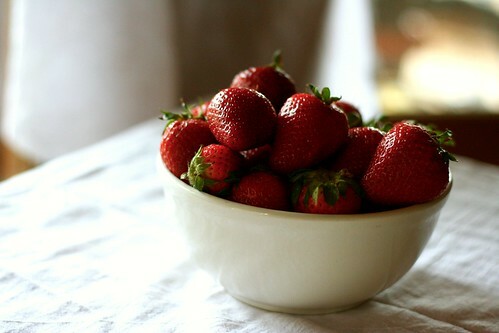 To make the filling: Just put the strawberries, cut, in a bowl and sprinkle with sugar to taste. Let sit for about 10 minutes or more, until they are juicy. Place whipping cream and vanilla in mixer bowl beat at high speed until soft peaks form. Scrape down sides, add powdered sugar, beat until sugar is dissolved. Chill until serving. note: I cooked mine for just 15 minutes and I burnt the first batch. Watch these carefully, at such a high heat, they tend to get too brown too quickly. My ALL TIME Fave!!! Looks fabulous. oh delicious. i need it to be warm so i can make that! How I long for summer! I definitely prefer things that are not too sweet. And homemade whipped cream IS the best. :) Wonderful photos, as always. 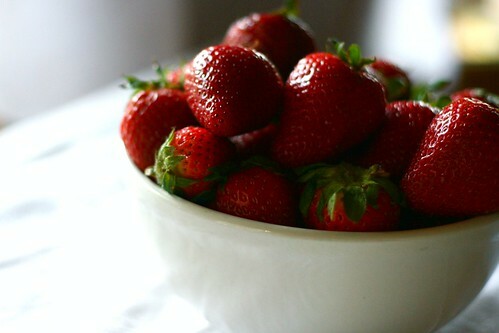 I've been on a strawberry kick lately, and these look absolutely perfect. Thanks for sharing Hannah! This reminds me so much of summers with my grandparents! They would make strawberry shortcake all the time since we lived near strawberry fields. 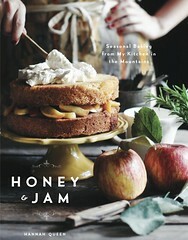 I haven't had it in years, maybe I'll try to make it soon! Thank you so much for sharing. This look so good. The strawberries are so brilliant & look like they're about to jump out of my screen! 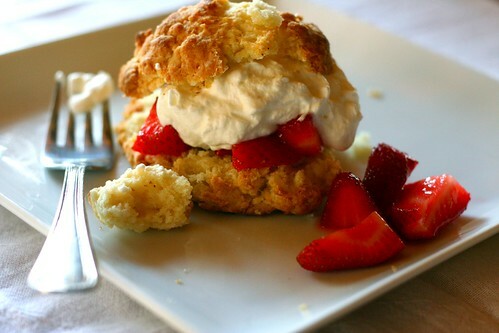 Shortcake in the afternoons, evenings, mornings, middle of the night...anytime for me! This is just gorgeous. Strawberry shortcake is one of my favorite desserts -- old fashioned, not too sweet, and the perfect vehicle for strawberries. It's funny though -- all the comments are about how summery this post is. Where I live (California) we're in prime strawberry season, and by summer they're all done. Oh, these photos… I’m going to have a heart attack. I love shortcake! Any day is shortcake kind of day! It’s one of my favorite desserts. Would you like to submit this to my “cake collection” event?